Slide forming machinery is a metal stamping technology in use since the 1930s, when it was first used to produce brackets, clamps, and electrical connectors. The technology uses four or more different slides to carry tooling horizontally to a central position on the part. The accurate, repeatable, and powerful slide forming machines can be used to produce parts economically, at much lower cost than those manufactured with power press tools. Tooling is also substantially less expensive, because complex forming operations that add cost to progressive tooling can be formed easily on slide forming machinery. Although slide forming is an older technology, slide forming machines can be an extremely competitive method for manufacturing specific parts--particularly intricate springs, stampings, and wire forms used for welded medical bands, surgical staples, wire formed clamps, retention spring clips, blade locks, clutch springs, and float wires. In addition to comparing favorably with progressive tooling, slide forming machinery can outperform other more expensive radial wire/strip bending machines. In addition, the slide forming machines produce a significantly reduced amount of material scrap because they don't require a carrying web like that needed by progressive tools. When the cost of materials is high, minimizing waste is key to running the part cost-effectively. This advantage is particularly pronounced in parts made of higher cost stock. A slide forming machine is basically a horizontal stamping press that uses a system of cam-controlled tools for producing small parts from sheet metal or wire. The machine is used for progressive or transfer stamping operations. Unlike other presses, the slide forming machine has moving slides with tools attached. These slides, driven by the shafts that outline the machine, strike the workpiece to form it. The shafts are connected by bevel gears so that one shaft is driven by an electric motor, and then that shaft's motion drives the other shafts. Each shaft then has cams that drive the slides, which are usually of a split-type. This allows the workpiece to be worked on four sides, which makes the machine extremely versatile. A hole near the center of the machine is provided to expel the completed workpiece. Frequently referred to as fourslide, slide forming machinery actually comes in several varieties: fourslide, multislide, and vertislide tools. Fourslide, as its name suggests, is the basic slide forming machinery, in which one slide is attached to each of four shafts. 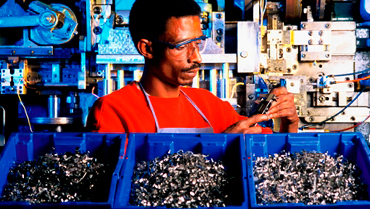 Multislide machines have eight slides, permitting extra forming motions. A multislide tool is typically somewhat stronger than a fourslide, to accommodate thicker parts. Vertislide is a fourslide or multislide machine, with the sides and tooling in a vertical position. The newest of the slide forming machines adds a fifth slide that comes in from the top of the machine to add expanded forming capabilities. Finally, slide forming machines do not need a carrying web, like those of progressive tools, resulting in significantly reduced scrap loss. Most tooling is designed so that no material is removed from the width of the part, which greatly reduces the amount of scrap loss. Fourslide machines do have disadvantages, the most significant of which is size constraints. The largest machines can handle stock up to 2.5 inches (76 mm) wide, 16 inches (320 mm) long, and 3/32 inches (2.4 mm) thick. Wire size is also limited, as is travel on the slides, and the throw of the forming cams. Shearing and bending operations can be done, but extrusion and upsetting operations are impractical because they hinder the movement of the workpiece to the next station. Drawing and stretching require too much tonnage, and the mechanisms required for the operations are space prohibitive. Finally, fourslide tooling set up does require a long lead time, making it most feasible for relatively high volume parts. Given slide forming's characteristics, it is especially well suited to smaller parts that require precise shape and size, several bends, and tabs that go in different directions. It is also useful when the part requires a bend that is greater than 90°, as well as for precise control of burr location and direction, and for control of bend orientation as it relates to the grain of a particular material. Grain direction is very important to the part's lifecycle when used in a spring application. Part use can range from medical to firearms, electronics, and commercial applications. Building tooling at lower costs than a progressive tool is a great advantage in today's market. While certain parts can only be made with a progressive tool, there is a huge area where parts could be produced with either machine. In those instances that lend themselves to production with slide forming machinery, it behooves OEMs to investigate the feasibility of using the lower cost process, especially where material costs are high. For parts made with stainless steel, Inconel, copper, brasses, and beryllium copper, which can range as high as $60-$70 per pound, using slide forming machinery may cost far less in tooling costs, while reducing scrap losses. This scrap reduction can be a great cost saving, because scrap losses can range from 20 percent to as high as 50-60 percent. Setup times are higher with slide forming, so the greatest cost advantages are found when running a fairly high volume of parts. One strategy for OEMs is to seek out a vendor with the capability of manufacturing the part with either progressive stamping or slide forming machinery, and obtain a quotation for both options. On one of Connecticut Spring & Stamping's (CSS) recent projects, involving a blade lock for the aircraft industry, the tooling costs for slide forming machinery were estimated at $7,100, while those of progressive stamping for the same part were $16,500. Connecticut Spring & Stamping also reduced the scrap loss by 27 percent because carrying tabs were no longer needed. Although the technology has been around for nearly a century, slide forming machines are still an extremely cost-effective option for the right combination of material, part configuration, and number of parts needed. Fourslide, multislide, and vertislide machines often prove economical for the production of intricate springs, stampings, and wire forms. The equipment can be used effectively to produce parts going into medical devices that connect internal workings, as well as blade locks found in jet engines, and even float wires in gas tanks that connect back to a sensor. Where material can cost as high as $60-$70 per pound, reducing waste is important. Tooling costs can be reduced by eliminating the carrying strip and using material efficiently. And that's a welcome result in any era. Pete Marut is a sales engineer, and Dale Pereira, a spring estimating engineer, at Connecticut Spring & Stamping, Farmington, Connecticut (www.ctspring.com).